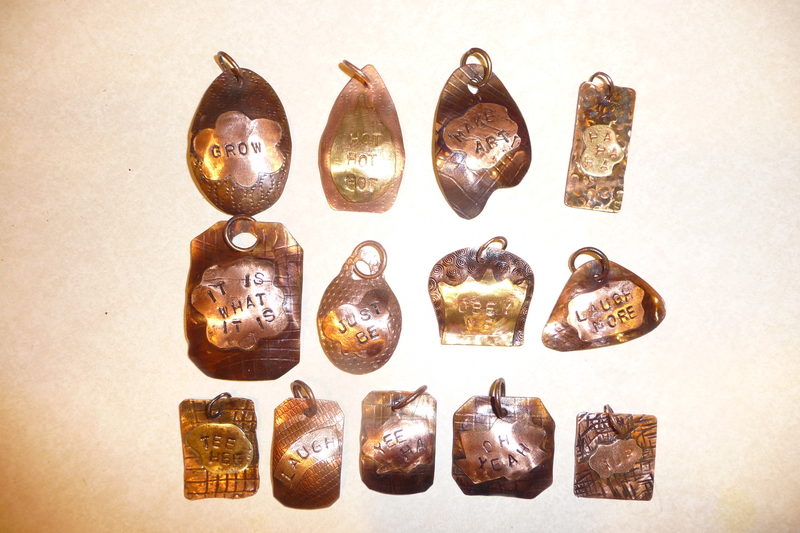 I finished these latest pendants in my garage studio. Silver soldering with a plumbers torch! FUN stuff! 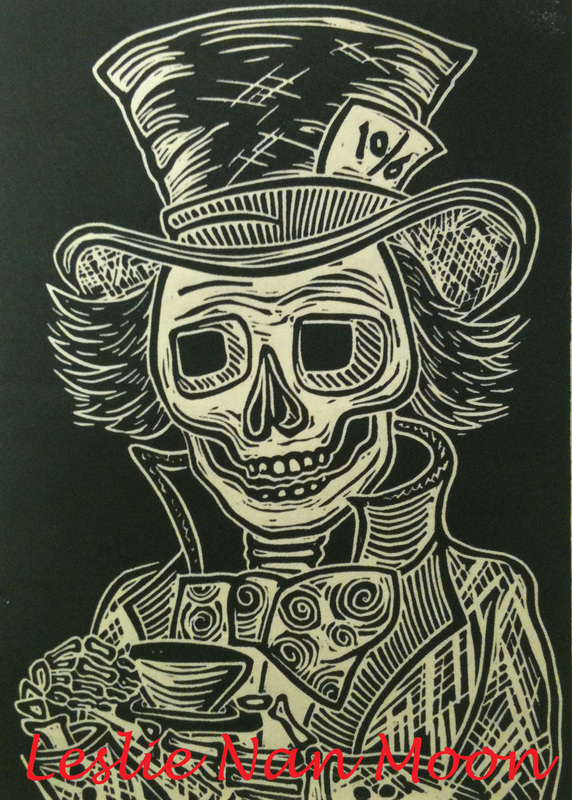 The first of my original block print series – When Dia de los Muertos meets Alice in Wonderland! I just got the piece, and it’s gorgeous! And it got here so fast! I like that you used the dark Scrabble tiles. They bring out the red in the bows and headband. Alice loves red. Nice symbology with the cat tails. I’m so glad you included the “we’re all mad here” phrase, and that the Cheshire Cat looks like he’s overseeing the mad tea party like some mischievous god. I love that you chose to spell out Alice’s name with the tiles. 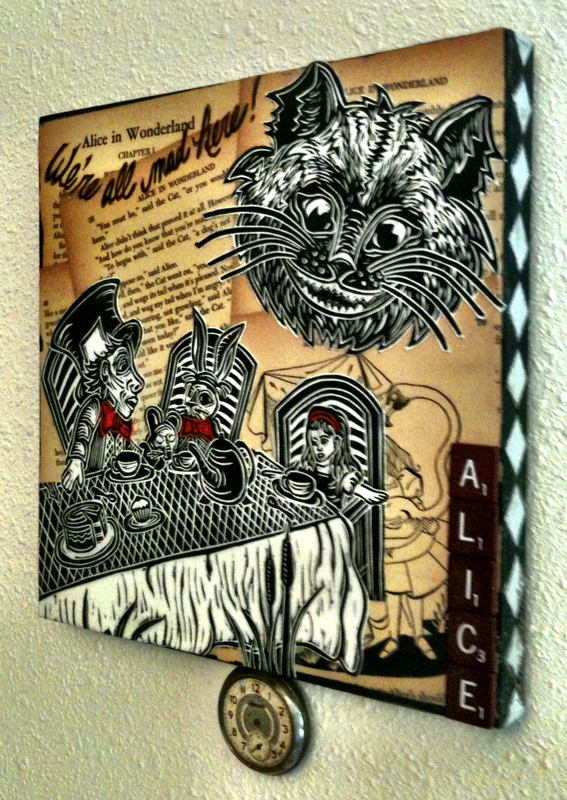 It makes it look like it’s saying “to Alice” and at the same time it could be the title of the piece. I also like the triple Alice: the Alice in the chair, the woodblock print Alice behind the chair, and the name spelled in tiles right next to them. It reminds me of the three Alices involved: the Alice in the story, the real-life Alice the character was based on, and the real-life Alice we’ll be giving this piece to. Thank you again. This piece is really something! Alice is going to flip. Blessings and wonderful wishes for you, you fabulous artist, you! You are currently browsing the Lesliemoon's Blog blog archives for June, 2012.